Surry County is located in the western Piedmont region of North Carolina, along the Virginia border. Although its county seat is Dobson, the largest city is Mount Airy, childhood home of TV actor and humorist Andy Griffith. The county was named for County Surrey in England, the birthplace of Governor William Tryon. Pilot Mountain is a distinctive landmark located in the county. The county population as of 2010 was 73,673. 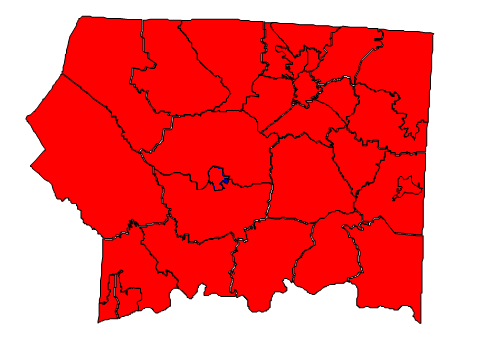 Surry residents vote Republican in federal, state, and local races. It has not voted for a Democratic presidential candidate since 1976, when the county voted for Jimmy Carter. Barack Obama performed poorly here compared to the Democratic average, and in 2012 Surry saw one of the biggest drops in Obama’s already poor performance. Forecast: Surry County was never a sure thing for Democratic candidates, but the loss of white working class-voters has hampered their prospects further in this conservative place. Bill Clinton did somewhat respectively with Surry voters in 1992, but the loss of manufacturing jobs brought about a massive drop in his support in 1996. The county has continued to trend Republican ever since. Simply put, Surry’s voters have no place in the current Democratic coalition, but many of them were never Democrats at all. The Religious Right is powerful here, and Democrats cannot win by stressing economic issues alone. Should Hillary Clinton win the Democratic nomination in 2016, she would probably do better here than Obama. But she would still lose in a landslide. There are some counties in this state that Democrats are never going to win at any level of government, and Surry is one of them. Fortunately for Democrats, however, Surry is representative of a North Carolina that is declining in influence, and some would say is dying. While Republicans will be guaranteed of staunch support from majority white and rural counties, in the future the battle for North Carolina will be in its urban and suburban areas. To emphasize this point, it is estimated that Surry is seeing a decline in absolute population. The county only grew by 3.45% from 2000 to 2010. If Democrats are looking for hope in Surry County in particular, it will probably be from the growing Hispanic population, many of whom work in agriculture. They now number 10% of the population.